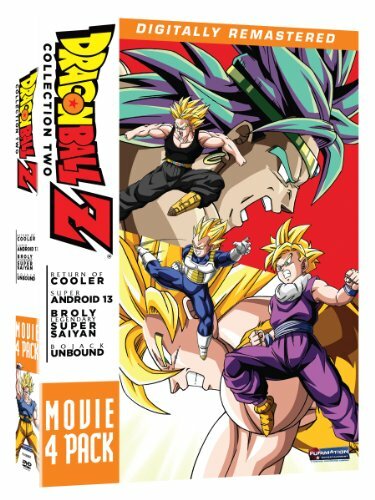 Prepare to level up with the Dragon Ball Z Film Collection Two! From Cooler to Bojack, this epic collection – featuring films six through nine – is the next step in your quest to attain every DBZ movie ever made! The Dragon Ball Z Film Collection Two: more action than you can handle! Return of Cooler:As an eerily familiar foe threatens the peaceful people of Namek, Goku and the Z-Fighters are summoned to save a world that is not their own. The face behind this heinous onslaught? None other than Cooler and his malevolent minions! The fate of Namek hangs in the balance, and victory won’t be so easy the second time around! Super Android 13:A mysterious fiend is creating Androids that are faster, stronger, and far more deadly than anything ever devised by the deceased Doctor Gero. Goku and the rest of the Z-Fighters must find the identity of the murderous mastermind if they are to halt the onslaught of his lethal inventions. Broly: The Legendary Super Saiyan:Broly – a powerful Saiyan warrior with an unspeakable evil streak – has the Z-Fighters squarely in his sights! Now, a race to save the universe turns into a test of survival skills for Earth’s mightiest warriors. Prepare for the most intense Saiyan battle in history: a clash for the ages rooted in the pains of a secret past. Bojack Unbound:Warriors from every corner of the galaxy are gathering to compete in the most incredible martial arts tournament ever conceived. Many will test their strength and skill, but few will live to see the end. Before a victor can be crowned, Bojack – a powerfully evil intergalactic villain – turns the tournament into a fight for survival!